I hope you are well into the creation of your vision board, if not totally finished with it! I started mine last weekend and still need to tie up a few things. I spent some time on Saturday with it and was surprised at how emotional of a process it was for me. I think partly because I spent it in reflection of the past few months, and in anticipation of the next ones. The next part of our challenge is elimination! Now that we’ve set the stage in prayer for the vision God has given us, written (or cut and glued!) what we envision out on paper or a board, now it’s time for us to simplify. I’ve found that many reasons we struggle with hitting our goals is because there is a lot in our way keeping us distracted and it comes in the form of a busy schedule, unorganized house, obligatory friendships, and an unhealthy way of eating. When we live a life of purpose, it’s crucial that we remove any deadweight. I think about the many road races I’ve ran in life. The goal is to carry just enough on me to get me to the end. No more, no less. Experienced runners know this and have worked through trial and error to figure out their exact configuration of what clothing to wear, how much water to carry, and more. As in any journey, it’s easy to pick up things that were perhaps used and helpful for a season but don’t benefit us anymore. We keep them attached and they’ve become part of us and we don’t even notice. We may use these things or people even as a tool for comfort and to remove them, may be too scary. This process of elimination, or maybe better stated, simplifying, may bring up some interesting things for you. Sure- throwing away that large stack of junk mail or dropping off the pile of clothing to Goodwill may bring you a big sigh of relief, but saying, “I’m sorry, but I have to stop being a part of this team” or creating some more space in between you and some people in your life may take a little more guts and courage. When you are tempted to back down, or give up, I want you to focus on the bigger “why” which hopefully is represented on your vision board. Motivation often comes AFTER we go through this process–not before. It’s rare that I am motivated to do some of this hard work but I’ve found once I’ve started, it’s hard to stop! My vision gets clearer, roadblocks are eliminated, and the energy has now built up to tackle what’s in front of me. 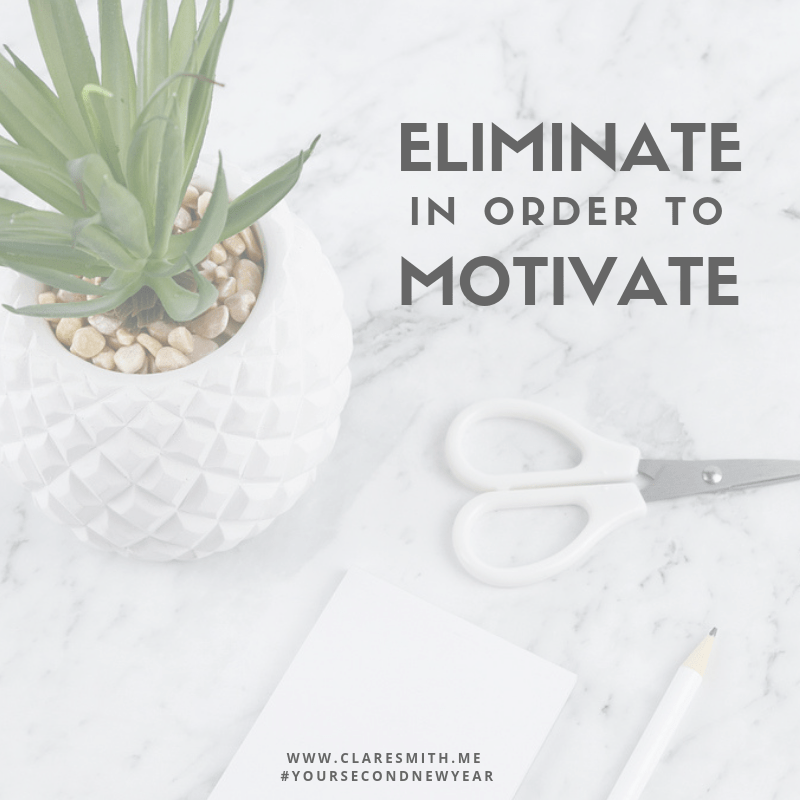 So your goal over the next week is to eliminate in order to motivate! Are you involved in something just because you were involved in it last year and it’s what you’ve always done? Have you always lead the committee because you don’t see anyone else stepping up? Make sure the things you are involved in are not because you are afraid of someone not taking your place, but because God has asked you to be there. This same rule applies with what our kids are involved in. It’s time to unfollow and unfriend. I did this about a month ago and it was very freeing! There is this cool thing on Facebook called “unfollow” if you still want to remain friends but just need to eliminate all the clutter in your feed. When you go to your social media feed, it should propel you, motivate you, encourage you, challenge you, and perhaps, make you laugh. If it does anything else, then it may be time to reconsider who you follow. Also look at your emails!! How many times do you just delete instead of unsubscribe? Take just 4 additional seconds to do that and remove the email even making its way into your space. I could write a whole post on this particular thing alone, but for now, consider who in your life you may need to put some space in between? Maybe some of you need to establish some boundaries. None of this will come quickly or easily so consider speaking with a counselor or good friend in this area. Financial constraints are a huge reason many of us aren’t able to achieve the goals at hand. There are many sneaky, little ways that our finances get out of control, so take a look at the small areas of spending you can eliminate. The afternoon coffee break (guilty! ), 3 things from Target’s $1 bins (also guilty), a monthly subscription of something you don’t really need….Eliminate unnecessary spending. What we consume is so very important to how we think, act and move throughout the day. There are some things you are eating that are not helping you get to your end goal. Does this mean we take an extremist look at food, never having sugar, chips, or savory dips? No. What this does mean, however, is it’s time to look into your behaviors in which you binge and then swing into a guilt/shame cycle. That is self-defeating and I don’t care what you say, it bleeds over into any momentum you have in other areas of your life. This includes eating super healthy too. Some of you need to remove the expectation of eating a certain, planned way because your ability to not hit that every day also causes you to spin into a guilt/shame cycle. That bag of clothes that need to go to Goodwill…it’s gone this week! The kitchen cabinet full of missing tupperware lids….organized! I could go on and on in areas where we could eliminate in our homes in order to motivate us more towards our goals. Pick a couple things (because this task in itself could be overwhelming!) to focus on and get them off your list. How you work through these categories and areas will look different for each person and it will also look different for YOU season to season. Really come to this exercise with an open heart. As you read through this, there will be areas that immediately pop into your head. Write those downs. Then, you may need to spend some more time chewing over all these. Once God has revealed anything, be certain to act. I know for me, it’s easy to think that I’ll take care of it later, but that is usually what gets us in this spot of overwhelm in the first place! As you scroll through instagram, start to remove accounts…same with Facebook. You don’t need a planned time to do it. Just start now. I posted this on instagram and Facebook earlier this week and feel it goes well with this post today. As we comb through the various areas listed above, let’s keep this in mind. 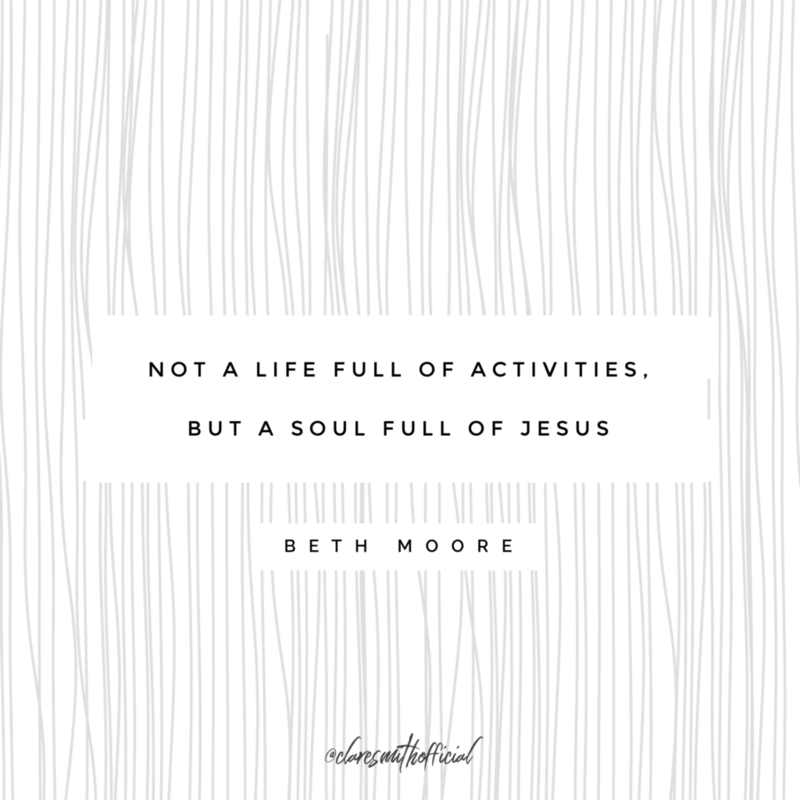 This is my marker for what my schedule is filled with, who it’s with, and whether it’s time to drop it or not….Does (fill in the blank) stir my affection for the Lord? Do I have time to spend time with God.. not just a 10 minute check-off, but times to soak in His presence a little longer? Does it cause me to depend on Him more and more? Am I using my spiritual gifts in order to bring glory to Him? And so forth. The goal isn’t to be involved in everything that you are asked. The goal isn’t to tend to every fire. The goal isn’t to be everyone’s best friend at every season. The goal is to keep a vibrant walk of faith in order that you may share that with others. This means that there are boundaries. We get used to saying “no”, or “I’m sorry but I’ve changed my mind.” It means we table things or people for a season or two. We have one more area to tackle before we close up this series and that is to create an environment conducive to your goals. If you get through this elimination process, you are already halfway through that final step! I’ll be back next week to talk to that! 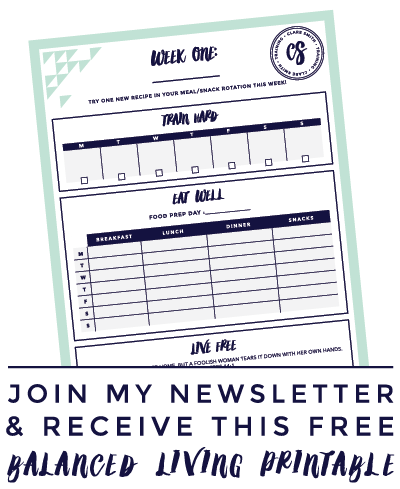 If you have any vision boards that you would like to share with me, I would love to see them! Please tag me or use #yoursecondnewyear so that I can find them. I understand that many of them may be private or personal in nature, so feel free to blur out any part of it that you don’t want seen! To see all the posts in the series, click here!